Surface studied by Felix Klein in 1874. Cartesian parametrization of an immersion in : with , where the fi are homogeneous polynomials with even degree. The (real) projective plane is the quotient space of by the collinearity relation. But, more generally, the notion "projective plane" refers to any topological space homeomorphic to . 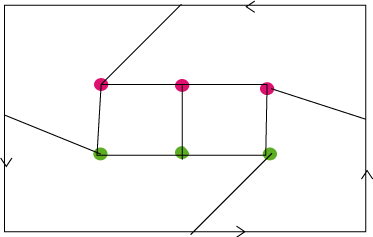 It can be proved that a surface is a projective plane iff it is a one-sided (with one face) connected compact surface of genus 1 (can be cut without being split into two pieces). 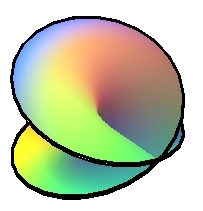 The chromatic number of the projective plane is equal to 6 (any map traced on the projective plane can be colored with no more than 6 colors, and there exist maps that need 6 colors). There even exist maps where each country touches the 5 others, one of which is represented opposite on the cross-cap, another one on a decagon with identified opposite sides with inversion of direction (cf. below). 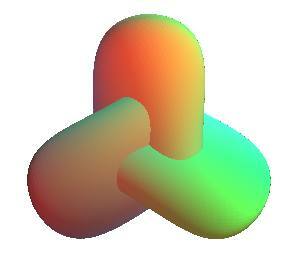 The three utilities problem can be solved on the projective plane, contrary to the plane. In other words, the bipartite graph can be traced on the projective plane without edges crossing. The same holds for the complete graph with 5 vertices that the reader will trace easily. - A full square the opposite sides of which are identified with an inversion of direction. This amounts to the previous construction, but allows to see the link with the Möbius strip in the following characterization (the strip being obtained by identification of only one pair of opposite sides). 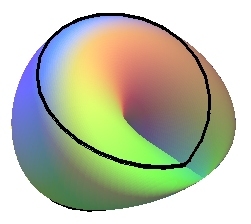 - A Möbius strip closed by a lid homeomorphic to a disk. 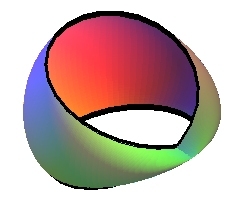 A Möbius strip is therefore a punctured projective plane. - the star polyhedron with the same edges as the octahedron called tetrahemihexahedron. - Henneberg's minimal surface, which is, additionally, a minimal surface. 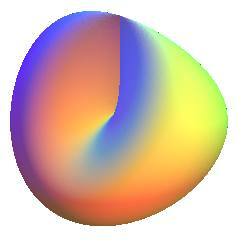 The equations given in the header are those of the surfaces of obtained by immersion of the projective plane. and for , we get Boy's surface (equations of Apery). 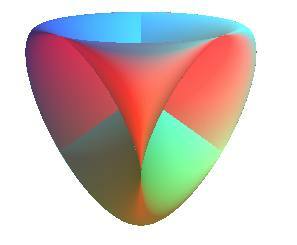 The Veronese surface is an embedding of the projective plane in . Here are 2 constructions of the projective plane illustrated on the cross-cap. ...is indeed equivalent to this!